Have a rollicking good time in Surf Paradise with some rocking waves and some quiet grassy knolls. You can win some fairly good coin prizes and, you can enjoy the simplicity and shade with a Rival Gaming slot that will take you away from it all. With the soothing sounds of waves gently lapping on a sea shore and seagulls gaily twittering above, this Surf Paradise Slot really lives up to its name acoustically. I can just imagine paddling my surfboard out into the gentle waves as they wash over me and invite me deeper, to enjoy the huge rush of a killer wave as I ride it all the way back to shore! The difficulties of finding a wave to ride fade into the distance as I lay back in the tranquillity and peace that have descended on my own personal Surf Paradise Slot. Behold, crashing waves in the distance with green, acres of hillside nestling behind them, in front loom some carefully placed palm trees and my trusty steed the surfboard nestles to one side, waiting for me to mount it and ride my way to the glory that can only be found in the Surf Paradise slot. 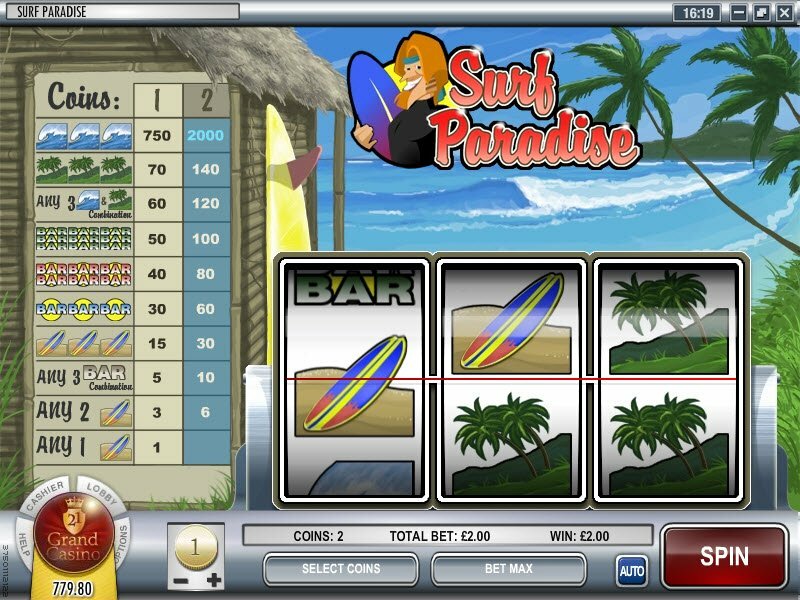 One or two surfboard symbols will net you the fewest amount of coins, closely followed by 3 prize surfboards scoring you 15 - 30 coins. 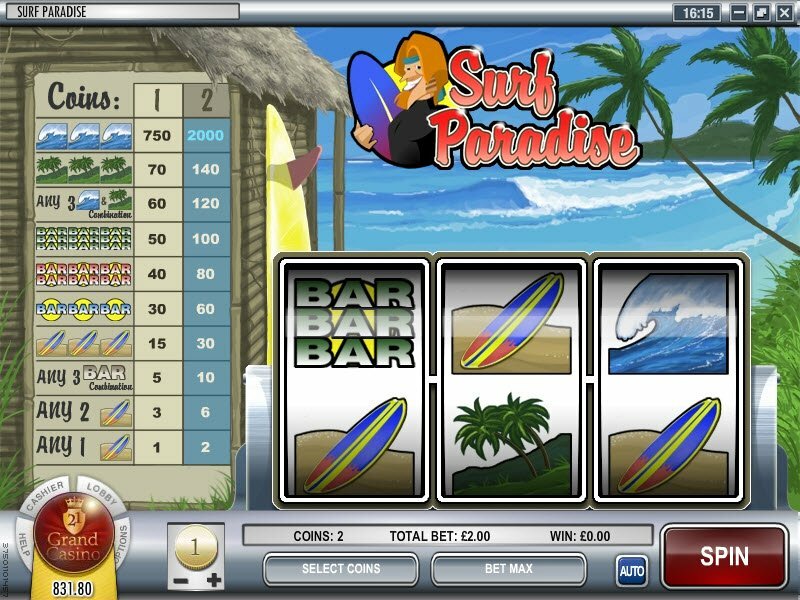 Our round yellow bars are between 30 and 60 coins and are two red lined bars, 40 - 80 coins can be won, depending on how many you spin on those reels. I can just imagine paddling my surfboard out into the gentle waves as they wash over me and invite me deeper, to enjoy the huge rush of a killer wave as I ride it all the way back to shore! Three green lined bars will score you well, between 50 and 100 coins are to be had with those. The calming sea and landscapes combinations will score you 60 - 120 coins. 3 calming landscapes will only net you between 70 and 150 coins but, in a twist of surfing law, 3 sea's with waves breaking can get you between 750 and 2000 coins! 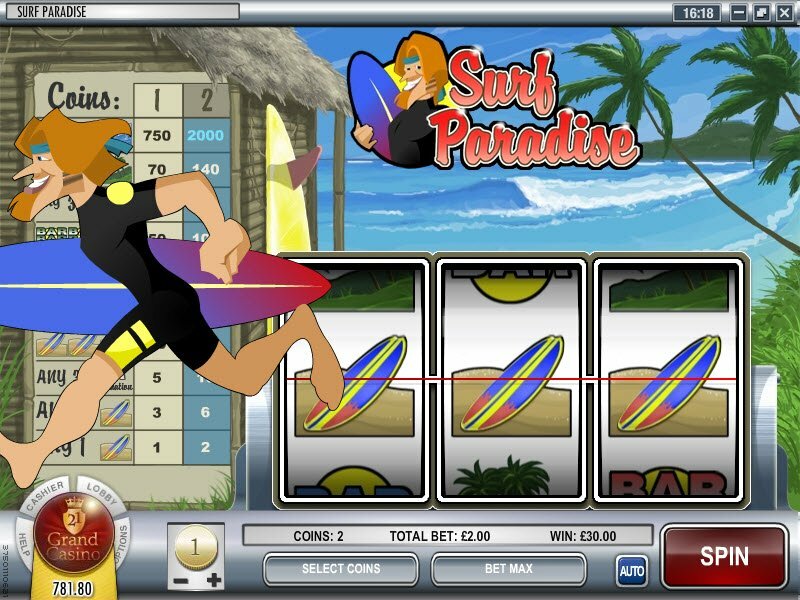 When you reel in two or more surfboards, our friendly surfer dude will scamper across the screen, off to ride his next wave out into the glorious sunny Surf Paradise Slot Bonus. -I don't know how to surf though!